UBC’s swim teams celebrate their championship titles together. Courtesy Martin Bazyl/Toronto Varsity Blues. The Thunderbirds were faced with some of the toughest competition they’ve had in years this past weekend at the U Sports swimming championships at the University of Toronto. Strong performances from the Université de Montreal Carabins and hosts University of Toronto Varsity Blues challenged the ’Birds for both the men’s and women’s titles — but UBC still came out on top. Despite the best efforts of their Eastern rivals, it would be UBC who finished on top with 1,151.5 points on the men’s side and a whopping 1,362.5 points on the women’s side — both over 200 points ahead of their closest competition. If UBC were to dominate the championships like they did last year, they would have to come up big in certain events where they were the underdogs. They started by doing just that, with Maia Brundage and Erika Seltenreich-Hodgson taking second and third in the women’s 200 metre freestyle. The two veteran ’Birds edged out favourite Katerine Savard of the Carabins in one of her main events — Savard was part of the Olympic bronze medal-winning 4 x 200 metre freestyle relay in Rio. On the men’s side, Markus Thormeyer and Yuri Kisil easily beat out the competition to take first and second respectively in the 200 metre freestyle event. Thormeyer clocked in at 1:43.78, knocking on the door of Varsity Blues alumnus Colin Russell’s decade-old U Sports record. The next big win for the Thunderbirds came in the men’s 100 metre butterfly where UBC newcomer Josiah Binnema won in a time of 52.13, holding off challenges from Gamal Assaad of the University of Western Ontario Mustangs and fellow Thunderbird Luke Peddie. Emily Overholt and Seltenreich-Hodgson took first and second in the women’s 400 metre individual medley, with Brundage coming in not far behind at fourth to continue racking up points for the Thunderbirds. By the end of the first day of competition, both the men’s and women’s teams were ahead in the points ranking. Continuing their dominating weekend, UBC had a strong performance in the women’s 100 metre backstroke. While Kylie Masse — Olympic medalist and world record holder in this event — won easily with a new U Sports record time of 56.38, UBC’s Ingrid Wilm was able to secure a spot on the podium by finishing third in a time of 58.57. In the men’s 50 metre butterfly shortly after, Luke Peddie just edged out Samuel Wang of McGill University by 0.07 of a second to take first. Jonathan Brown then put UBC back on the podium for a men’s breaststroke event for the first time in a while by taking third in men’s 200 metre event. As for the 50 metre breaststroke, it was UBC’s Warren Mayer who came out on top in a time of 27.58, just beating favourite Eli Wall of the Varsity Blues by a mere 0.08 of a second. Yuri Kisil kept the ball rolling for the ’Birds as he won the men’s 50 metre freestyle event in a new U Sports record time of 21.50, beating his own previously held record of 21.69 that he had set in preliminaries. But it was in the relay events where UBC scored big, taking first place in every men’s relay and a podium finish in every women’s relay. The ’Birds may not have dominated the individual events like they did last year, but they cleaned up the relays which was more than enough to seal the win and let both the men’s and women’s teams retain their national titles. 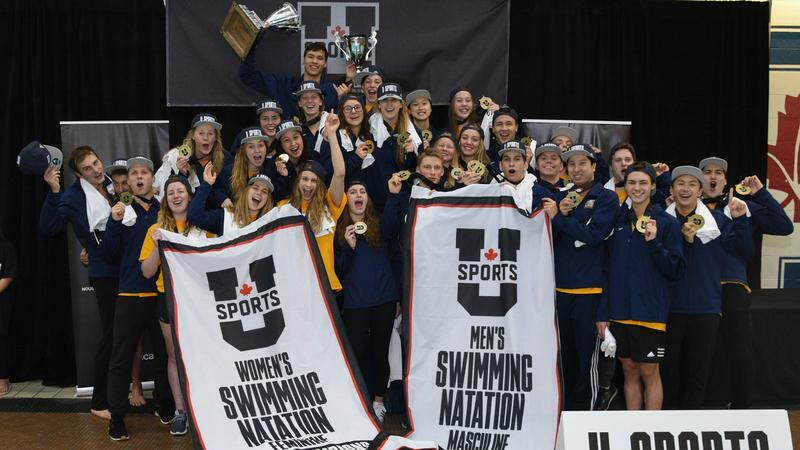 They continue to reign supreme over Canadian university swimming.